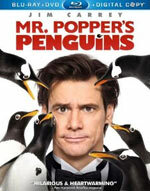 What’s interesting about the film Mr. Popper’s Penguins is that, oddly enough, it seems to include many similarities to other Jim Carrey films while also sticking closely to the family comedy formula. The fantastical and the cartoonish is the norm for such films, but they’re also a trait of many of Carrey’s own more “mature” comedies. For example, in his 1997 film, Liar Liar, Carrey plays a divorced lawyer who is a pretty inept father and through extraordinary circumstances is able to slowly mend his broken family. In that situation, too, his ex-wife is with someone else and Carrey’s character has to deal with trying to keep his wife (and kids) in his life. 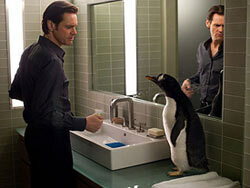 In Mr. Popper’s Penguins, Carrey’s central character is once again divorced and also a successful businessman. In Liar Liar, the plot’s extraordinary circumstances get in the way of his trying to make partner with the law firm. Here, Popper is trying to make partner with a large real estate giant. In both movies, he needs to decide what’s most important to him — his family or his job. Fans of Carrey’s work (and by now, there’s a very, very good chance that young people who went to see Liar Liar in the theaters might be taking their kids to see Mr. Popper’s Penguins today!) will definitely find the material in this film familiar. There were certainly times I was expecting the plot to go a certain way that it may have in other films — even when he was trying to make news anchorman in Bruce Almighty while having to decide what’s really important in his life there. The idea of Carrey’s successful businessman character having to win back his family because he’s essentially kind of a jerk in actuality is kind of a tired idea. It’s nearly a big strike on Popper’s Penguins, but it doesn’t quite ruin the movie in the end. Alongside Carrey is a decent but not especially standout supporting cast that includes Carla Gugino (who was the object of Stiller’s affection in the first Night at the Museum) as Popper’s ex-wife, and the legendary Angela Lansbury as the owner of Tavern on the Green, which Popper is trying to get her to sell to his firm. Clark Gregg, who I saw last play kind of a villain in In Good Company and who is currently making the rounds in the superhero films that lead up to next year’s Avengers collaboration, steps in as the foe here. While Gregg was fairly good in those aforementioned roles, he’s a bit one-dimensional and kind of cheesy as this film’s “villain” who wants the penguins for his zoo. His character is kind of stereotypical for this genre, but he still pulls it off more effectively than many in that position usually do. 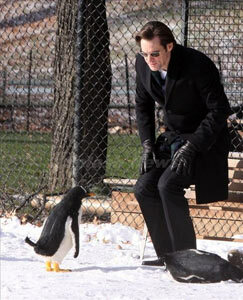 In the end, the penguins and Carrey really are the best thing that Mr. Popper’s Penguins has going for it, which tend to make the film feel a little bit smaller than it could have been, but director Mark Waters (Just Like Heaven) does a fair job making Mr. Popper’s Penguins one of the better films of its kind. Still, in retrospect, Waters does the movie a bit of a disservice by not keeping it grounded in a sense of reality, allowing some of the characters to feel more cartoony than they could have been. The worst scene is when Popper turns his ritzy apartment into a snow palace, complete with the stairs becoming a snow slide that has a table with a snow cone machine at its base. Then the film’s climactic scene feels a lot like the large-group scene at the end of, ironically, Evan Almighty (the sort-of sequel to Carrey’s Bruce Almighty that actually didn’t even star Carrey). It’s a corny finish, and far more goofy than I’d have preferred it. But while it doesn’t ruin the film for me, the escalation of absurdity up until this point does seem to hold the movie back from having a stronger outcome. Nimrod & Stinky’s Antarctic Adventure (6:11) – This animated short is a simplified, 2D cartoon about the zookeeeper coming to Antarctica to try to bring the birds home to his zoo. The animation is a bit herky-jerky and not all that enjoyable to watch. It kind of plays out a bit like a Wile E. Coyote and Road Runner cartoon with a bit of the Madagascar penguins thrown in for good measure. Deleted Scenes (14:32) – There are a whopping twelve deleted scenes with optional commentary by Director Mark Waters, Editor Bruce Green, and Visual Effects Supervisor Richard Hollander. The first scene, called “Young Popper Classroom” shows a little Popper on a career day in class where his father couldn’t make it. As he talks about what his dad does, the class gets really intrigued, which just encourages him to keep talking about his dad. “Popper with Homeless Man: Part 1” takes place right afterwards where Popper coaches a homeless man in how to better his begging technique. “Part 2” follows and is a pretty amusing scene where Popper and Pippy walk past the homeless man as they talk about his business deal. The fourth scene is an extended version of Popper meeting Rick outside his ex-wife’s home. “Popper Meets Kent” shows him bumping into Kent outside his door as they talk about how much more sunlight Popper’s apartment gets than Kent’s. “Popper’s Lonely Weekend” shows him scoping out Tavern on the Green by himself and then entering his bedroom with two bags of gifts for his kids. The seventh scene shows Popper building a “pen” for the penguins out of the furniture in his living room. “Popper Escapes The Guggenheim” shows him running out of the Guggenheim and then telling off the penguins before arriving back at his place to find them there. The penguins are shown here in pre-viz state, so no real or fully animated penguins are shown. “Popper Presents Tower” shows Popper presenting a Tower on the Green condo model to his business partners. “Popper Meets Staff” is an alternate take where he makes a joke about kidney pie. “Popper and Amanda” is actually a lovely scene where the Tavern staff give Popper some pointers on his “second first date” with his ex-wife. It turns into a pretty cute sequence that probably should have been left in. “Popper Says Goodnight” shows him walking Amanda to a cab after the date and “Popper, Kent and The Board” shows Kent bringing The Board to Popper’s place to try to get him in trouble. And finally, “Popper Escapes Zoo” is a brief moment where the Poppers plan on getting out of the zoo. Gag Reel (2:05) – What Jim Carrey film is complete without a gag reel? It’s a cute batch of clips that consist mostly of Carrey goofing off on set, with a few takes of the penguins missing their cues and marks. It’s not the funniest gag reel, but it’s worth a look. The Legacy of Mr. Popper’s Penguins (4:04) talks about the origin of the story, which was first printed in 1938. We learn a bit about authors Richard and Florence Atwater as they mix in interviews with family members and historians with clips from the film. Ready for Their Closeup (8:28) is dedicated to the real penguins in the movie and how the cast and crew interacted with them and trained them for their scenes. Here we learn how the set had to be refrigerated, while a special pen and training rooms were also built nearby on set. All of the major cast talk about what it was like to work with the penguins and we get to see quite a bit of b-roll and behind-the-scenes footage (as well as some more cutting up on set). Ladies and Gentoomen (5:55) features a penguin specialist from Sea World San Diego who talks about the Gentoo penguins, while clips from the movie are spliced in. It’s an informative piece for anyone who wants to know a little more about these cool animals. Stuffy Penguin Theater (4:21) – Mark Waters introduces this one to explain how they used stuffed penguins to mark where the digital penguins would go. We then see different versions of scenes from the film in their on-set footage form where we see the stuffed versions on set with the cast and crew, and then the finished scene right afterwards. It’s a pretty neat concept for a featurette and a fun one to watch, too. 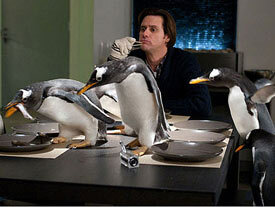 Penguin Pandemonium (with commentary by Director Mark Waters, Editor Bruce Green, and Visual Effects Supervisor Richard Hollander) (3:12) – This takes the scene where penguins are first crawling all over Popper’s apartment, complete with commentary, and shows all of the many steps that these scenes go through to get CGI inserted into a live action scene. It’s really interesting and makes for a pretty cool featurette. We see the scene acted out without penguins by Jim and the director, then with various stages of animation, all the way to the final film version. Original Story Sampler – Never read the original book? Here’s your chance to preview the first pages on your Blu-Ray disc. You get about sixteen pages (the first three chapters), along with the original illustrations, which are also given a slight tweak of added animation to them. It’s a neat idea. A theatrical trailer and feature-length audio commentary with Director Mark Waters, Editor Bruce Green, and Visual Effects Supervisor Richard Hollander round out the Blu-Ray’s extras. While not loaded with extras, what’s here is pretty good and it adds to the fun of the feature film.